Latex is often preferred as a material for medical gloves for its unique comfort, fit and feel. However, its allergenic properties mean that it can be a problematic choice for healthcare institutions. The Medline Sensicare PI Ortho Powder-Free Surgical Gloves MSG94 are composed of a unique synthetic Isolex polyisoprene (PI) formulation which mimics the properties of natural latex without any of its allergenic proteins. 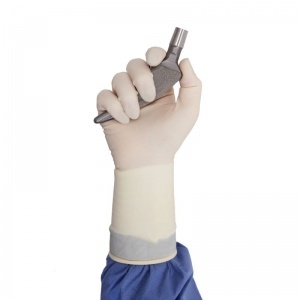 With a 40% thicker design than the standard Medline Sensicare PI Surgical Gloves, the Ortho are ideal for high-risk surgery such as orthopedic and trauma procedures. The product code for these gloves is MSG94. Please note that an additional two digits denote the glove size, e.g. MSG9480 for Size 8. The Medline Sensicare PI Powder-Free Surgical Gloves are available in seven different sizes, making them suitable for most users. Please consult the table below for details and select the appropriate size for you from the drop-down menu above. Please note that to ensure the highest level of quality for our customers, the Medline Sensicare PI Ortho Powder-Free Surgical Gloves MSG94 are not suitable for return. If you are unsure about the suitability of these gloves for your purpose, please check with our customer care team on 020 7501 1104 prior to purchase. This policy does not affect your statutory rights as a consumer.